Former U.S. president George H.W. Bush died on Friday at the age of 94. 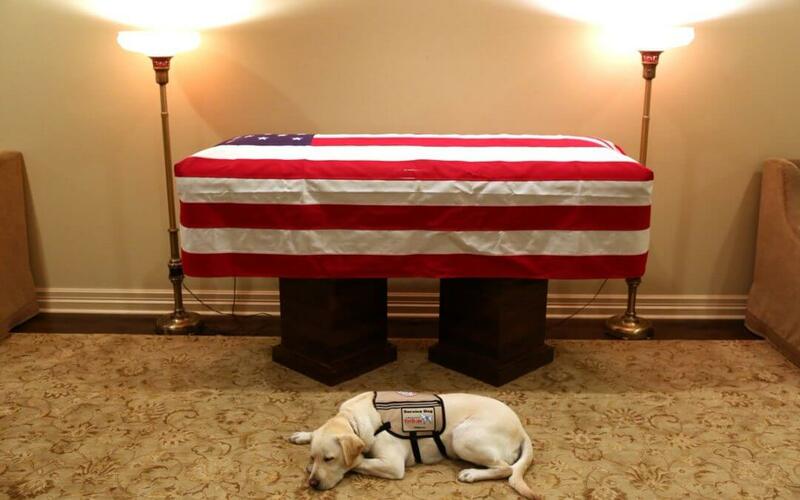 His service dog, a yellow Labrador named Sully, remained by his side as you can see from this heartbreaking photo. As USA Today reports, Bush family spokesperson Jim McGrath tweeted a photo of Sully laying next to the 41st president’s casket. The caption, “Mission complete,” says it all. Sully was assigned to H.W. in June to accompany him everywhere he goes, including when he went to vote during the midterm elections in November. The loyal canine came from America’s VetDogs, who matches veterans and first responders with service dogs to improve quality of life. The organization says Sully will join his fellow service dogs at the Walter Reed National Military Medical Center to help wounded soldiers in their Facility Dog Program. The Michigan Humane Society waives all pet adoption fees for veterans and active military personnel with our MHS for Military program, presented by Sellers Subaru.